Light up your world with a whole new level of insight from your data. With Qlik you can now break free from the constraints of traditional BI and benefit from a sea of new, data-driven opportunities. Sounds interesting? 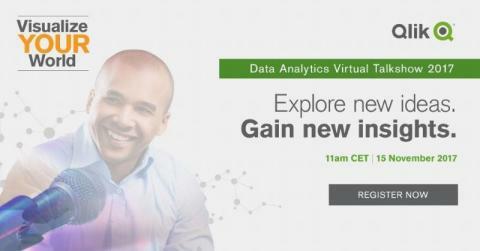 Attend the Qlik Virtual Talkshow and discover the possibilities. This unique one-hour online event will bring you the highlights from the Visualize YOUR World Data Analytics Tour 2017. Robert Fleming, Qlik’s VP of International Marketing, will host the session with an array of distinguished guests on Wednesday 15 November 2017 at 11:00hrs CET. Hear the very latest on Qlik’s market leading analytics innovations. Gain new insights around Big Data for Big Insights. Explore new ideas and hear about best practices and real-world case studies. It’s your world. Bring it to life with the power of analytics. Register now for this free Talkshow ― live and online ― taking place on Wednesday 15 November 2017 at 11:00hrs CET. Qlik® is the leading visual analytics platform and the pioneer of user-driven business intelligence. Its portfolio of cloud-based and on-premise solutions meets customers’ growing needs from reporting and self-service visual analytics to guided, embedded and custom analytics, regardless of where data is located. Customers using Qlik Sense®, QlikView® and Qlik® Cloud, gain meaning out of information from multiple sources, exploring the hidden relationships within data that lead to insights that ignite good ideas. The Qlik Virtual Talkshow is a unique online event, bringing together the industry’s leading analytics minds to discuss the best ways to get actionable insights from data, big or small. Following on from our hugely popular Visualize YOUR World Tour, the Qlik Virtual Talkshow takes all the essential topics and distills them into one fascinating live online panel discussion. You’ll learn how Qlik’s cloud-ready analytics platform delivers incredible value, and how Qlik is building on its unique Associative Difference™ to drive a new wave of analytics that allows you to augment your intelligence across all your data, people and ideas. This recent blog post outlines five key things that you should know about the latest version of QlikView.